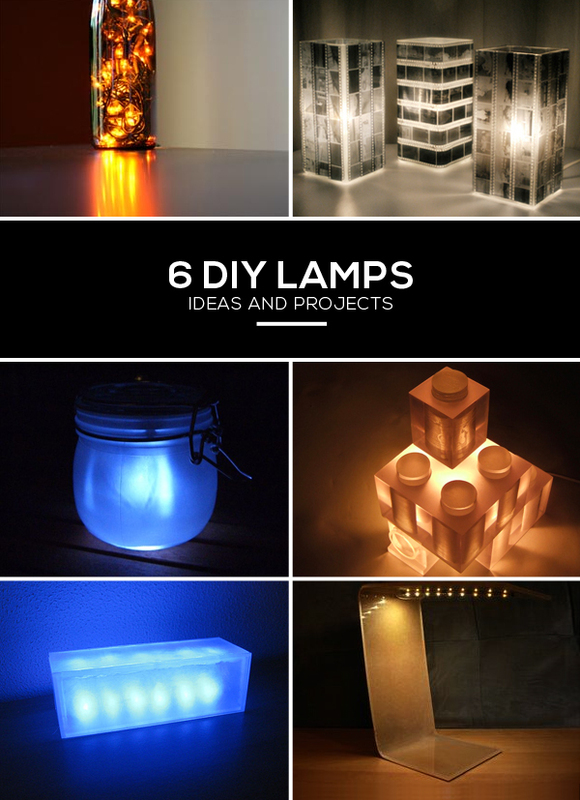 Looking for some inspiration for DIY lamp ideas? Here we have some of the best looking and creative projects, that are relatively simply to do. From using Lego bricks, to old camera film, here are 6 ideas to try out for your next project. Claire of Poopscape.com used a $6.99 Ikea lamp and stuck black and white negative film onto the glass shade. 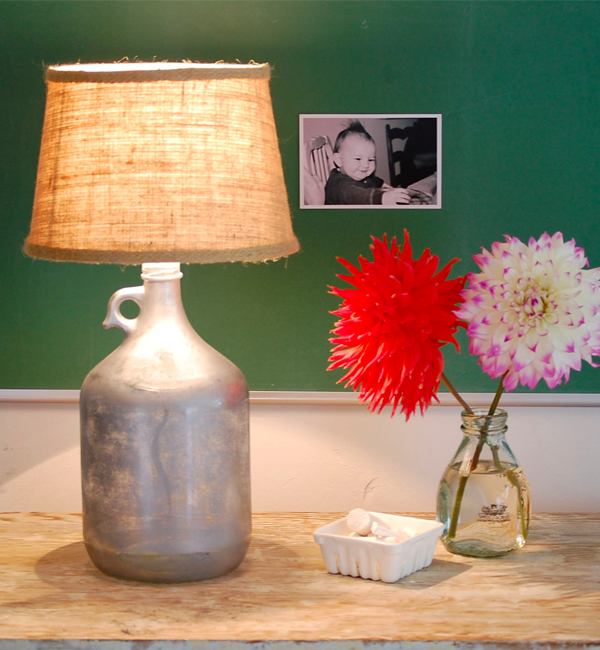 The result is a stunning DIY lamp. What makes this lamp so special are the images – they can be tailored to a holiday, group of friends – anything. Check out her step by step tutorial on this simple but amazing DIY lamp idea here at Poopscape (site no longer available). We’ve highlighted the SunJar before, which are Mason jar solar lights costing around $25. 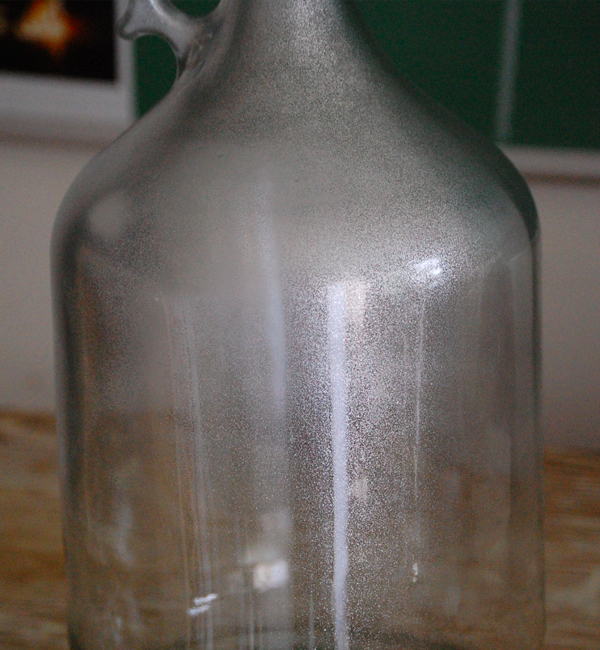 If you want to go about it yourself, here is a tutorial on how to create a diy sun jar replica (Instructables.com). There are quite a number of different parts and steps, but you’ll get the flexibility of choosing different styles of jars or even vases. All you’ll need here are transparent Lego blocks and an LED light (as they will give off less heat and won’t melt the plastic). There are no instructions on this one. The photos shown here are from a shop called red5.co.uk that no longer sells a kit of blocks and light. The other photo is from Tzuwei Tai, a designer who went out and made his own blocks. There is a range of transparent Lego blocks available from Amazon here, which you can use to put together your own DIY Lego lamp shade. On another post we highlighted a DIY LED music visualizer lamp, which is a lamp that pulsates with music that is plugged into it. This DIY project takes the LED box lamp, and adds the element of syncing music. The tutorial can be found here. Or another LED DIY lamp idea is to create or buy an 8x8x8 LED cube. These lamps can also be programmed to display 3D images. A tutorial on how to make and program your own 3D LED cube can be found here. Here is a simple, elegant, minimalist looking lamp. The parts used to form it are acrylic, birch veneer and an Ikea LED strip. While the tools needed to make it are: a heat gun to heat and bend the acrylic, a glue gun and an iron to stick the birch to the acrylic. You can find the tutorial here. 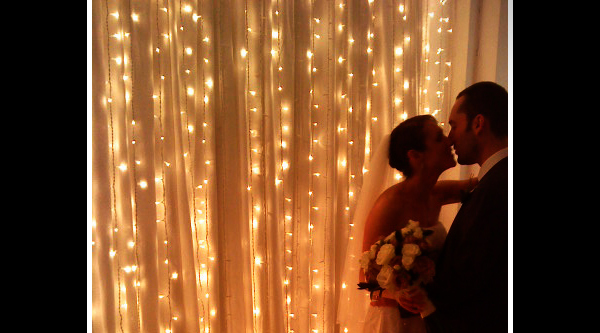 Creativity can go a long way, especially when you are looking to create DIY wedding lighting. For a small and intimate wedding, a DIY approach could be enough lighting to set the ideal backdrop. A larger wedding, say in a banquet hall, can still make great use of DIY lighting – but simple event light fixtures will be needed to fill up the space with enough light. Most wedding venues, such as hotels, will already have these fixtures for you to use, inclusive of the venue package. They can also be easily hired separately from event and lighting companies. Below we have set out a number of simple ideas that will turn a wedding space into an elegant setting. Simple outdoor string lights, also known as fairy lights, can be used to provide a wide range of different wedding lighting effects. 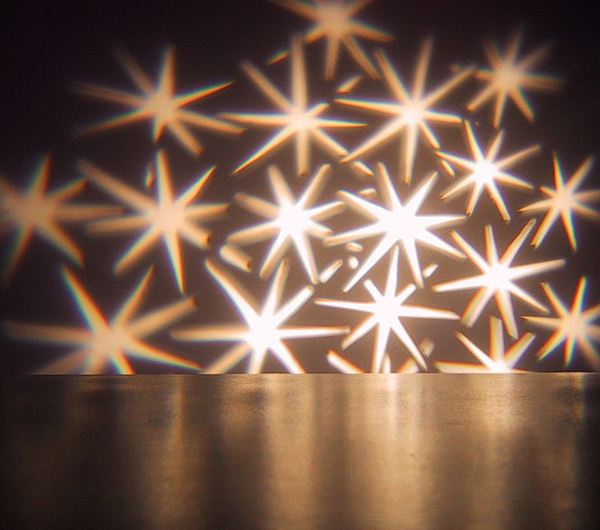 They are inexpensive, easy to work with, and create an enchanting lighting effect. They are well known for being red and green for Christmas decorations, but there are a wide range of different colors. Even the wiring that connects the lights together comes in other colors than green, so they can blend into different decorations. They come in an LED version which produces less heat, which is ideal for incorporating string lights for a wedding with decorations such as fabric or origami shades. The easiest thing to do is string them along tables and walls. You can arrange them on a wall to spell out the names of the bride and groom or create a simple heart. You can cover them up with a light fabric which will hide the lights and create a softer glow. 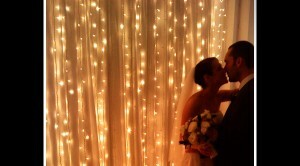 A Curtain Of Light: One straightforward idea using string lights is to create wedding curtain lights. This is where you hang a number of string lights side by side. This can be done on a white or on a black backdrop to create a starry effect. Fabric can be hung behind the lights. Going Green: For a professional look, use string lights with greenery. Pine branches wrapped with lights to make garlands for bowers or tables. Hang lighted wreaths sporting your wedding flowers or colorful ribbons. You can also find white string lights (white lights and white wiring) and have tree branches painted in white to create minimalistic decorations. This can also be applied if you are looking for outdoor wedding lighting ideas. String lights can be used to decorate and light up trees, flower beds, bushes, pathways, and create romantic backyard wedding lighting. Creating a Canopy: String lights can be hung from the ceiling to mimic a starry night. You can hang them in simple rows from one wall to another or you can create a canopy of light. This is usually done for wedding tent lighting, but can also be done in banquet halls to create a tent like effect. To do this you’ll need to find one spot in the ceiling from where all the string lights will hang from, and fan out. Origami Shades: With the help of little paper origami shades, normal string lights can be turned into decorative light fixtures. A simple and creative idea that can take on many shapes and sizes. 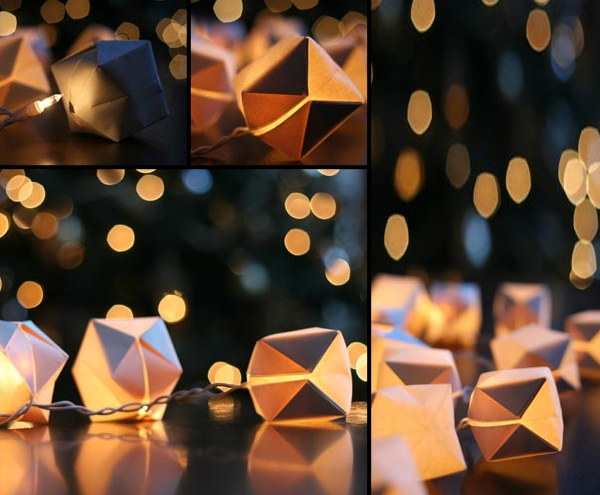 Take a look here for our post highlighting a tutorial on creating origami string lights. These small lights, along with a battery can be useful for a number of simple wedding lighting ideas. They can be used to effortlessly create unique centerpieces – arranged with flowers, and accessories. There are even submersible LED lights than can be placed inside water. LED light up ice cubes can be used inside of drinks to make them more dynamic, and tie them into your theme. With the use of normal balloons, LEDs can be easily turned into wedding lighting decorations. All you need are balloons and store bought LED lights that come with a battery (when you pull on a tab, the light is activated and turns on). The LED lights are simply placed inside the balloon before you blow them up. 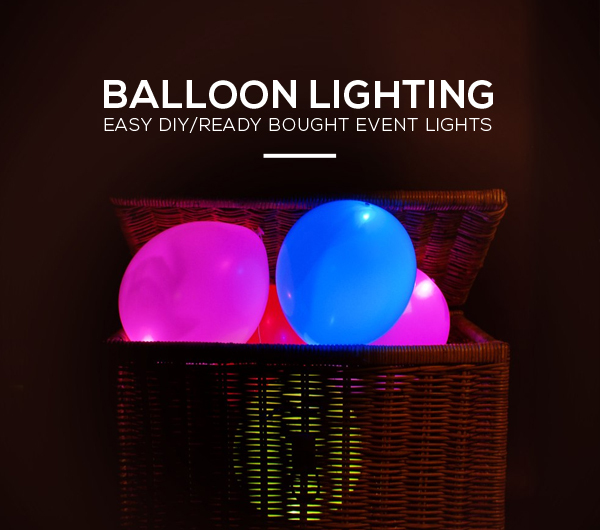 These balloons can be used to line the walls, placed on the dance floor, or if you are looking for DIY outdoor wedding lighting ideas, they will even float on water in fountains and ponds. You can even fill the balloons up with helium, and they will float in the air or can be tied down with string. White balloons are a popular choice for this DIY project but if you are looking for purple wedding lighting then purple balloons will do the trick. 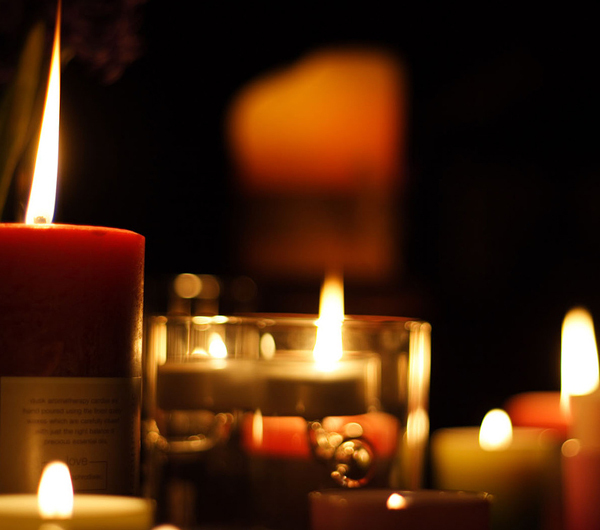 Candles always add a romantic touch to a wedding. These are ideal for creating table centerpieces. Wedding candle centerpieces can be arranged with flowers and other decorations such as polished pebbles or feathers. They can even be placed within a jar or bowl of water as they will float. Our post on beach wedding centerpieces has a nice section on creating unique DIY candle centerpieces. For other do it yourself wedding lighting ideas have a look at these DIY lighting resources: Lighting DIY projects at Instructables LEDs + Music: Want to try something a bit more techie and dynamic for a DIY wedding lighting project – then try out this tutorial on creating a LED Light Box that syncs and pulses to the beat of the music. If you are looking for simple home wedding lighting ideas here is a unique one: balloons + Glow Sticks/LEDs + Helium = Floating Balloon Lights. There is nothing more effortless than a white balloon glowing with light, slowing moving in the night. 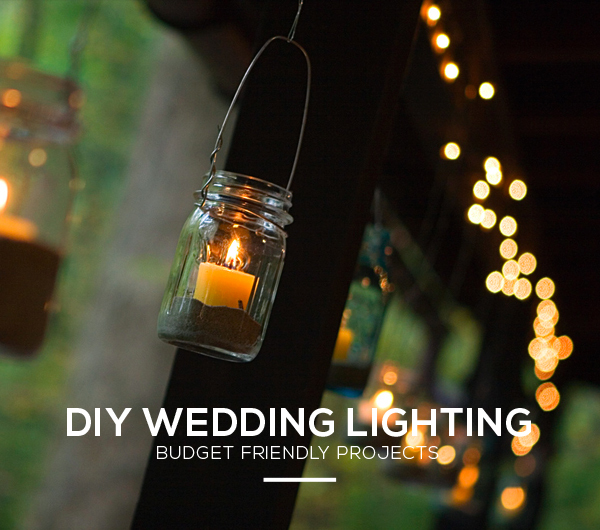 This can be easily done as a DIY wedding lighting project or can be readily bought online. ‘Illoom Balloons’ are ready made LED balloons. These do not require any electrical work as they work on a tiny battery. The LED light is already installed within the balloon, and pulling a tab will activate the light when you are ready to use them. They will shine for 15 hours or more. Look to buy the white ones as the reviews say these light up the best – and is a color scheme that works well for most styles of lighting for wedding receptions. These Illoom Balloons are normal latex balloons – helium easily escapes through latex material. If you are planning on inflating the balloons with helium, as they will look elegant floating around as outdoor wedding lights, they will need a liquid sealant to hold the helium and stay inflated longer. This can be easily done for you in shops that fill balloons and provide helium tanks. If you are planning on going down the DIY route, you will want to look for balloons that are treated with Hi-Float, a water soluble, transparent plastic material – ideal in preventing helium from leaking. You can always forget the helium (blow them up normally) and use them as wedding lighting decorations. Have the balloons lying on the tables, on the dance floor or line the walls with them. How about hanging a net to hold the balloons? Illoom Balloons are available from firebox.com for £9.99 for packs of 15 balloon led lights (they deliver internationally).